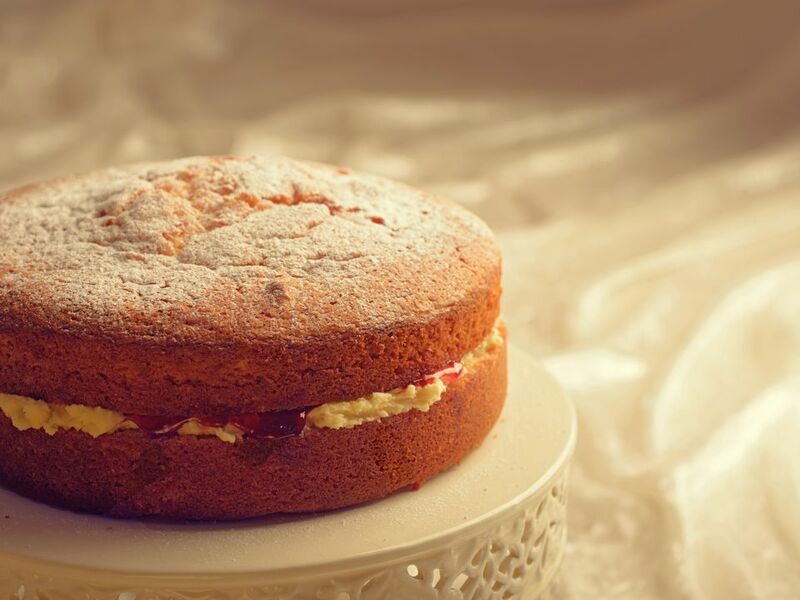 A Victoria sponge is the classic cake of the British kitchen. Furious debate abounds on how to make one and there is much competition on who can bake the best. Though this traditional cake is seen as the perfect afternoon tea treat, it also can have a place on your festive table when warmed through with the delicious spices reminiscent of Christmas. The traditional Christmas cake is much-loved, but for some, it can be a little heavy, being as rich as it is with dried fruits, brandy, and spices. This Christmas spiced Victoria sponge cake, therefore, perfectly suits those who prefer a lighter confection. The spices will make the cake a little darker than the usual cake. Unlike the rich fruit cake, the sponge does not keep very well, but is so irresistible it's doubtful you would want it to. Gather the ingredients and preheat the oven to 350 F/180C/Gas 4. Lightly grease two 8-inch/20 cm sandwich tins with a little butter and line the bottom with lightly-greased baking parchment. Using a stand mixer or electric hand mixer, beat the eggs, 1 cup/225 g of the sugar, flour, baking powder, and butter together until thoroughly combined and has a soft, dropping consistency. Evenly divide the cake batter between the two tins. Smooth the surface of the cake very lightly with a palette knife and bake on the middle shelf of the oven for 25 minutes or until the cakes are well risen and golden brown on the surface. Lower the oven temperature if you feel the cakes are cooking too quickly, but do not open the door if at all possible. Once risen and brown, you can open the door to check by gently pressing the center of the cake and it should spring back quickly. If so, remove the cakes from the oven and place on a cooling rack for 5 minutes. Once shrinking away from the sides of the tins, remove the cakes and leave to cool completely on the cooling rack. While the cakes are cooling, place the remaining sugar into a large saucepan with the water. Add all the spices and bring to a gentle boil. Continue to cook and reduce the mixture by a half. Remove from the stove and leave to cool. Turn the cooled cakes cooked side down and using a pastry brush, brush on the syrup a little at a time, allowing the cakes to absorb the syrup before adding more. Do not over saturate the cakes. You do not want them soggy, or they will fall apart; the syrup is to flavor the cake, not drown it. Put one cake on a serving plate, cover with a thick layer of raspberry jam, followed by an even thicker layer of whipped cream. Top with the second cake. Just before serving, cover with the icing sugar.